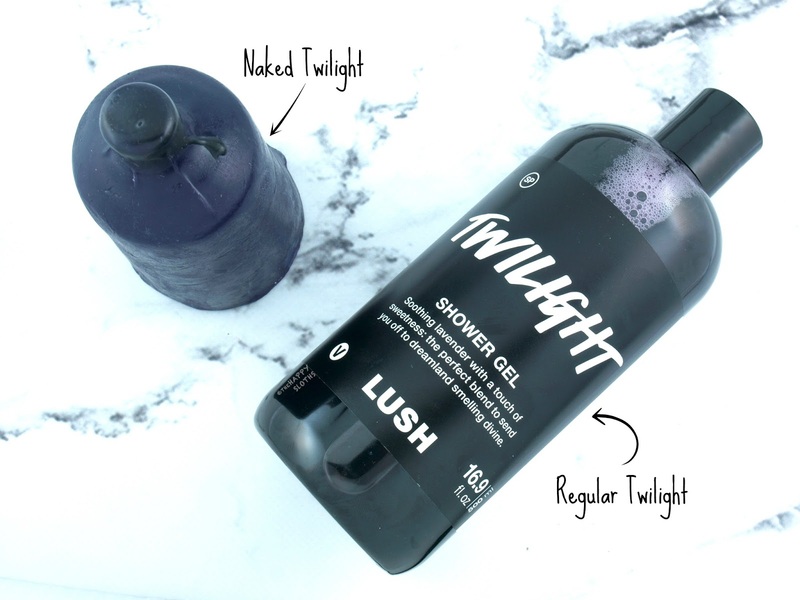 Molded to look like the regular Lush Shower Gel bottle, the Naked Shower Gel is a solid shower gel that lathers and cleans while leaving behind soft and moisturized skin. So right off the bat, I was pretty confused with the idea because isn't Naked Shower Gel just soap? Well, according to Lush, the Naked Shower Gels are in fact different from their bar soap formulation. Instead of using the usual Lush soap base (ex. rapeseed oil, coconut oil), the Naked Shower Gels contain most of the same ingredients as their liquid counterparts. What makes the shower gel solid is the sodium stearate, a thickener that hardens the liquid formulation. Also included in the Naked Shower Gels is propylene glycol, a humectant that helps skin retain moisture. It also absorbs excess water in the Naked Shower Gel, acting as a natural preservative by reducing bacterial growth. So technically speaking, the Naked Shower Gels are different from Lush bar soaps. However, they still are soaps in the sense that they are solid cleansers that contain a salt of a fatty acid (i.e. sodium stearate). Nevertheless, I like the idea of packaging-free products that promote more eco-conscious consumerism. The solid formulation lathers really well and it leaves the skin moisturized and supple. Although you don't have to fumble around with a bottle, the Naked Shower Gels do get a little slippery and messy so make sure to have a good soap dish handy. For Holiday 2017, the Naked Shower Gel range includes six scents, which are also available as regular liquid shower gels. 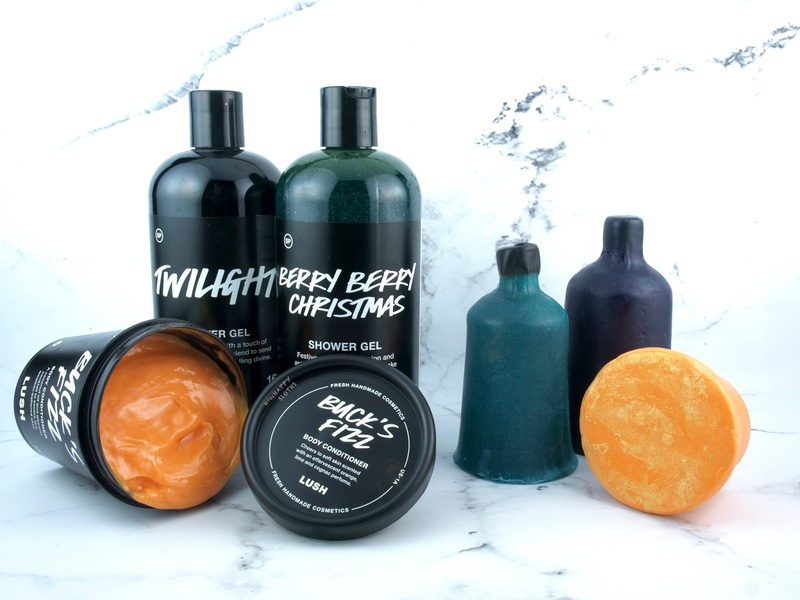 I have here Naked Twilight ($14.95 CAD) and Naked Berry Berry Christmas ($17.95 CAD). 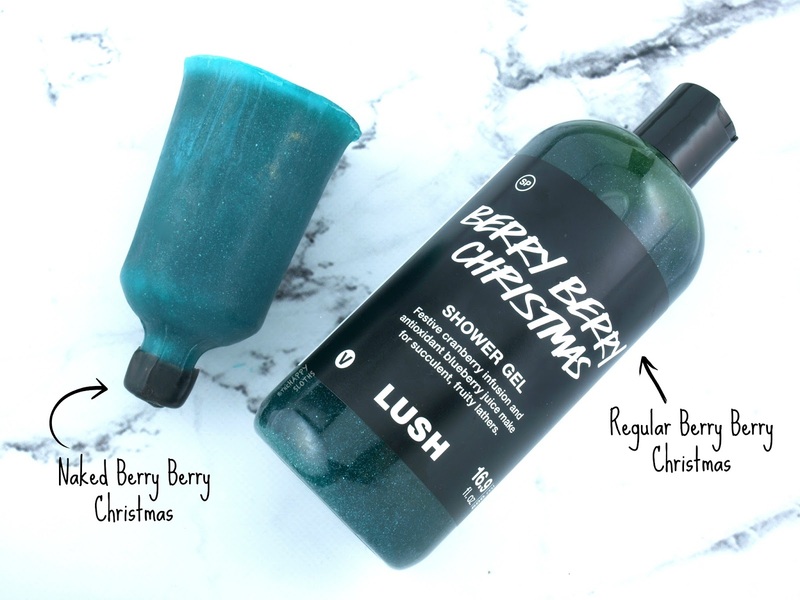 Twilight is a gorgeous winter soiree thanks to its calming notes of lavender, benzoin, tonka beans, and ylang-ylang while Berry Berry Christmas is a sweet and tart berry fusion made with cranberry, sweet orange, blueberry, and bergamot. The naked and the liquid versions smell pretty much identical but the naked smell is a little more subtle when lathered onto the skin. With that said, I definitely feel that with the solid Naked Shower Gels, a little goes a long, long way. I just started using these but I reckon that you can get at least two to three months of daily use out of each bar. Also joining the naked family is a trio of Naked Body Conditioners available in the classic holiday Lush fragrances (Snow Fairy, Buck's Fizz, Christingle). Designed as in-shower body moisturizers, the Naked Body Conditioners are applied and rinsed off after your regular body wash to reveal softened and nourished skin. Unlike the Naked Shower Gels, the Naked Body Conditioners are formulated pretty differently from their packaged counterparts. The traditional, liquid version has a light cream base made with glycerin, almond oil, and coconut oil while the naked solid version is made with cocoa butter, murumuru butter, and shea butter. So naturally, the liquid version is a lot more lightweight and spreadable while the solid version is a little more viscous and leaves behind a heavier residue. A little goes a long way for both, however, so use sparingly to avoid end feeling too greasy. 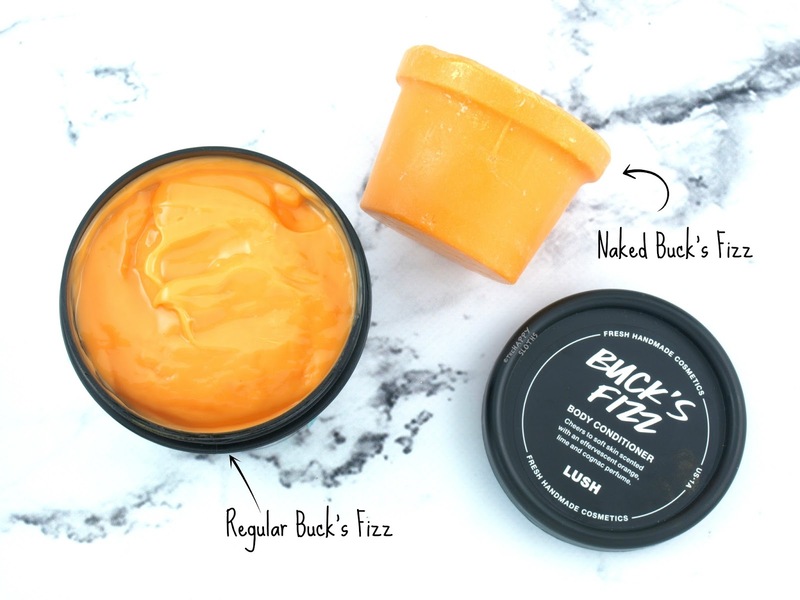 Naked Buck's Fizz ($13.55 CAD) shares the same citrus fragrance as the original Buck's Fizz, thanks to its fresh pink grapefruit, orange blossom, and Brazillian orange. The sweet and yummy scent is very uplifting and it leaves the skin soft and smooth. In my opinion, the original is perfect for all skin types while the naked version is more suitable for drier skins. Both can also be used as a body lotion without rinsing off although they do leave behind just the slightest orange tint. Have you tried any of the new Lush Naked Shower Gels or Naked Body Conditioners? Are you team packaged or team naked? Share with me in the comments below!